It all started when I was back in secondary school, about 1988/89, in my hometown of Coventry, UK. My best friend at the time showed me these neat little figures he’d picked up from this store called Barnby’s in the town. They were some little metal characters. I guess he’d been collecting them on the sly, and had a few dozen of them already. There were dwarves, elves, some orcs, skeletons, necromancers/wizards etc etc. At first I really didn’t pay them much attention. I must have started to like them, because before I knew it, I was collecting the bloody things. I was mystified by these little creatures, and even wondered what they hell they were made for. This was back in the day when Games Workshop released Dr Who figures, Judge Dredd/2000AD, D&D, Call of Cthulu etc etc as well as their regular ranges of Warhammer/ Warhammer 40K, Talisman etc. Back then, you could buy a blister pack of 5 miniatures for a piffling £1.50 (about $3.00). And so, my love/hate relationship with tabletop wargaming was born. It was a fair while before we realized that you could actually buy paints for them and paint them up, so gradually, me and my friend(s) picked up figures and paints and it all spiralled from there. We would make trips to Birmingham on the number 900 bus (a big deal when you’re 11 years old!) to go to the one and only ‘local’ Games Workshop store to buy more mini’s to satisfy our cravings. This was also how we found out about the rulebooks, army lists, boxed sets and what have you. The rest, after that, is a blur. There was a time where I gave up the hobby, as it didn’t have that magical spark that the hobby started out with. I think it was also due to the fact that GW was making it a little less grim and foreboding so it was a bit more kid friendly. It was also due to the fact that the prices seemed to be getting crazy, and that a bunch of my army had been wiped out in one foul swoop thanks to the release of the Warhammer Fantasy Battle box set (rendering a bunch of troop types and rules obsolete). It seemed a lot more sterile. I started dabbling (and still do) with historical wargaming, as I love history and the wargames rules that are available. It is pretty hard finding someone who will play (and who has the time), so at the moment, this is just a little bit of self indulgence. I blame my drummer for getting me back into the hobby, and ultimately crippling my bank account, so Colin, I will get you back! 🙂 I went over to his place to hang out one afternoon, and I saw some gaming magazines lying about for some company called Privateer Press. The figures and painting contained therein looked cool, but I thought no more of it, until he somehow convinced me to have a game of Warmachine. That’s when I caved and decided I wanted to collect, paint and play with little toy soldiers again. 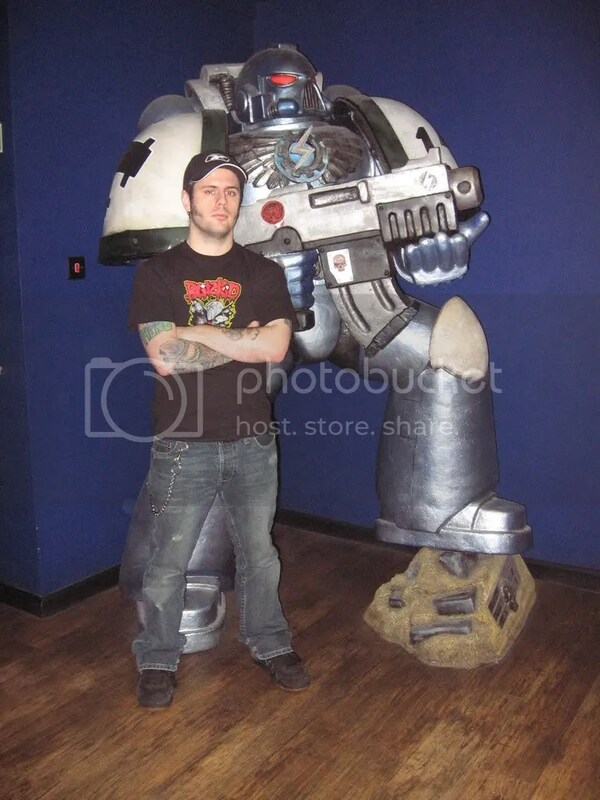 Not only that, but he got me back into Warhammer 40K as well, much to the chagrin of my long suffering girlfriend (now wife) Diana, who has to share our home with lots of little painted men and He-Man toys as well as me and our two sons. Indeed I live in Chicago now. I do come home and visit as often as I can. I’ll be out there in October for 3 weeks, getting married! FW are actually coming to Chicago for Adepticon in about 3 weeks… I already put in an order lol! Congrats on getting married! Does your future wife support your hobby?? I know mine does. I wanted to go to Adepticon but I don’t have an army completely painted yet and I don’t see any reason for going if I don’t take part in the tournament. With that said, can I ask you a favor? It involves Adepticon, a request to purchase a certain item for me… I know you don’t know me so if you don’t feel comfortable doing it just let me know… What say you? Well thank you sir! My fiance its somewhat bemused by my hobby, and sometimes makes fun of me, but she is really impressed with the work I do and does support me, which is awesome. Nice to meet you, Lee! sorry about the late reply… doh! What armies did you play?